When your blood pressure is high, it’s important to include plenty of vegetables, whole grains, and fiber in your diet. Stuffed bell peppers incorporate all of these into one convenient meal. This Mediterranean version includes whole grain quinoa, chickpeas, and plenty of vegetables, which all provide filling fiber. The bright red peppers and tomatoes also provide vitamins A and C and the antioxidant lycopene for a nutritious punch. Stuffed peppers are easy to prepare and hold up well in the refrigerator for lunches during the week. You can customize what you add to them. Switch up the grains with brown rice or farro if you have it, or add different beans and vegetables that need to be used up. You can also add cooked chicken or steak if you want to add a little more protein if you plan to eat the peppers by themselves. Cut bell peppers vertically down the center in half and remove stems and seeds. 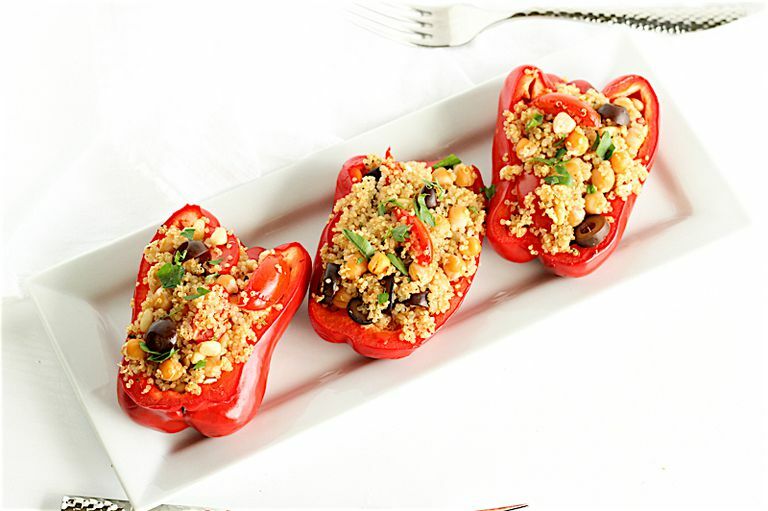 Place peppers on a baking sheet lined with parchment or a silicone baking mat. In a mixing bowl, combine remaining ingredients. Scoop mixture into pepper halves. Bake for 20 to 25 minutes, or until peppers are soft but still hold their shape. Remove from oven and sprinkle with parsley before serving (optional). You may use cooked brown rice or other grain, such as farro, in place of the quinoa. Include any vegetables that you have in your refrigerator that need to be used. Serve these stuffed peppers hot as a vegetarian dinner or cold as lunch. Serve one pepper half as a side dish with grilled chicken or fish for a higher protein meal.